WPGA A home for gliding-kite pilots! Public apology: Dear Public, we do not condone the uprooting of public shrubs and trees that has been done by some un-airframed canopy glider users. We now recommend stopping inland canopy paragliding while encouraging airframed single-tether hang gliders for inland flying, because of the collapsing costs and the environmental cost . Such poor behavior may cause erosion, slides, and destruction of the natural setting belonging to animals and people. And we are sorry that so many canopy riders are costing their lives, bodies, and loved one's interests; the public cost is rising; see CometClones for a significant (yet incomplete) peek at part of the costs. with or without humans aboard. 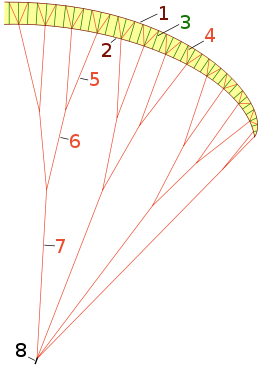 Any wing may be used in a gliding kite system: paraglider. Solid, semi-solid, fully flexible, stick-framed or not: Any wing. Newbie myth: "Paragliding is an adventure sport featuring lightweight, free-flying, foot-launched glider aircraft that possess no rigid primary structure." Not generally true, as the craft may have as much rigidity as wanted to accomplish particular interests and purposes. MORE ACCURATE: Paragliding uses paragliders (gliding kites) which may have as much rigidity in their primary structure as one wishes for purpose. Purpose may be far beyond sport, e.g., play, recreation, science, commerce, military, industry, art, photography, etc. Sport paragliding involving flown pilot is a kite sport using gliding kites called paragliders. The World Hang Gliding Association has awarded Gustave Whitehead, Tony Prentice, John Worth, Charles Richards, Barry Hill Palmer, Thomas H. Purcell, Jr., and James Hobson, Mike Burns, John Dickenson, Richard Miller, Bill Bennett, Bill Moyes, Dave Kilbourne, Richard Eipper, and Peter Brock, a combination Flex-Wing Hang Glider Gold Air Award for their showing simplicities in hang gliders using the four-boom flex-wing radiating out of standard kiting and gliding extant public-domain arts or the Rogallo-NASA-Ryan-Paresev environment using public-domain arts extant since the first decade of 1910. The Gustave Whitehead teachings that were inspired from the works of others like Otto Lilienthal, Percy Pilcher, Wenham, and others and the most simple hang glider in Breslau of 1908 that had the simple cable-stayed A-frame we use commonly today, combined with the works of these hang glider men of the Flex-Wing Hang Glider Gold Air Award, firms the impossibility of anyone fairly claiming global mechanical "invention" of the basic core hang glider that saturated the 1960s until even prior arts in flying wings saturated designs post 1974. The Gold Award by WHGA is open for the entrance of other men or women to the special award as data justifies; please send in flex-wing hang glider historical data to the FlexWingHangGliderGoldAirAward@WorldHan ... iation.orgfor processing and possible adding people to the award. The public-domain art extant in 1961 was super simple to copy and make into one's own tinkered wing; the ancients could have had the flex-wing four-boom hang glider thousands of years ago for successful flight as did the men of the this WHGA Flex-Wing Hang Glider Gold Air Award. One can trace the mechanics of Hobson's or Eipper's four-boom flex-wing hang glider right into the first decade of 1900s. The minor tweaks of ornamental appearance for tweaked site and use missions remain part of the story of the flex-wing hang glider.